Procedure: Cover selected concepts in chapters 29 and 30 using a packet on these concepts. Show total internal reflection using a prism and a spiral plastic tube. Show properties of concave mirror by focusing sun rays. Procedure: cover topics in chapter 28 to achieve above objectives. Procedure: Use a reading quiz to introduce chapter 27, teach concepts from chapter 27 to meet the objectives above. Show two Flash animations on measuring the speed of light. Demos as time allows: laser light will carry a signal to a solar cell, the ringing of a bulb filament, neon bulb makes solar cell buzz, sugar solution polarizes light, flexed plastic shows stress under polarized light. Procedure: the students will perform a lab on polarization. Describe a property of each type of EM radiation, i.e. x-rays, UV, radio, etc. Procedure: teach concepts from chapter 27 to meet the objectives above. A worksheet on light will be used to check comprehension of chapter 27. Procedure: teach chapter 26 to cover the above objectives. Demos for this chapter include the whirling tube, the striking of different sized copper pipes, the fire organ, straw trumpets, tuning a guitar, glasses or bottles filled with different amounts of water. Students with presentations on sound will present this week. A conceptual development page will be used to check comprehension. Procedure: students will perform a lab activity on the speed of sound waves using tuning forks and graduated cylinders. Procedure: Finish chapter 26 to cover the above objectives. Demos: Pasco tone generator to show compression and rarefaction of air in sound waves, constructive and destructive interference, whirling pool tube, aluminum rod (nodes, natural frequency), copper pipes, silence in a vacuum. A conceptual development page will be used to check comprehension. Procedure: Continue with chapter 25. Students will do worksheet 25-1 for comprehension. Demo: use ripple tank to show the Doppler effect on water waves, spinning buzzer to demonstrate Doppler effect. Homework: chapter 25 review questions. Procedure: teach chapter 26 to cover the above objectives. Demos for this chapter include the whirling tube, the striking of different sized copper pipes, the fire organ, straw trumpets, tuning a guitar, glasses or bottles filled with different amounts of water. Students with presentations on sound will present this week. A reading quiz will be given on Tuesday. A conceptual development page will be used to check comprehension. Review for test on chapters 36 and 37. Objective: students will be able to demonstrate knowledge of concepts covered in chapters 36 and 37 by taking a test. Procedure: administer test on chapters 36 and 37 on magnetism and electromagnetic induction. Homework: take notes on chapter 25 for a reading quiz. Procedure: Administer reading quiz on chapter 25. Use springs, rope, ripple tank, sing the Pi song to explain and discuss waves and wave motion. A worksheet will be used to check comprehension. Demos: vibrating spring, vibrating rope or string, ripple tank with overhead projector. Procedure: students will perform a lab activity on waves. Procedure: cover sections 37.7 and 37.8, review for a test on chapters 36 and 37. Homework: selected review quetions from chapter 37. Procedure: first review magnetic fields by showing pins over a powerful ceramic magnet, then cover sections 36.7 - 36.8. Demonstrate electric meters and motors using the galvanometer, ammeter and visible electric motor. Activity: have students construct a simple motor using a coil of wire, a plastic cup and a permanent magnet. Procedure: cover sections 37.1 to 37.3. Show current generated by turning a motor armature. Demonstrate how a guitar pickup works. Reading guide on chapter 36. Procedure: Discuss circuits, simple, series and parallel. Show characteristics using a circuit in class and a volt/ohm meter. Draw simple circuits. Explain characteristics of series and parallel circuits, demonstrate using volt/ohm meter on a parallel circuit. Homework: chapter 35 review questions, due Thursday. Procedure: Finish chapter 35, short circuits, fuses, circuit breakers. Go over graded materials from chapter 34. Review chapter 35 by going over homework. Students will do a review worksheet on circuits. Demo: show the operation of a fuse by using steel wool in an AC circuit of lamps in parallel. As the load on the circuit is increased, the fuse burns out. Procedure: Using lamps and wire, students will design and wire series and parallel circuits on a pizza box. Procedure: students will perform a lab on Ohm’s law. Procedure: students will learn how to design and draw series and parallel circuits. Procedure: Administer chapter 34 reading quiz on Monday, discuss concepts covered in chapter 34. Demos include: demonstrate how current varies with voltage by using a light dimmer, show alternating current vs. direct current using red and green diodes, oscilloscope, steel wool on 9 volt battery. Students will follow demonstrations using supplemental worksheets. Students will complete and submit seatwork. Procedure: concepts of electrostatics will be summarized, students will do a worksheet to check comprehension. Homework: review exercises for chapter 32, due Friday. Demo: use Van de Graff generator to demonstrate properties of charged materials. The concept of electric potential will be discussed and a worksheet will be distributed for the second half of the period on electric potential and voltage. Homework: chapter 33 review questions, due Thursday. Objective: students will reinforce concepts on static electricity, electric fields, electric potential. Procedure: review concepts from chapters 32 and 33 for a test on Friday. Go over electrostatics packet and potential worksheet. Test on chapters 32 and 33. Procedure: continue with chapter 32, Electrostatics. Students continue to work in groups on the packet, to examine properties of charged materials. Demo: use Van de Graff generator to demonstrate properties of charged materials. Procedure: students will finish the electrostatics packet. Students will build and use an electroscope. They will assemble a capacitor. Discussion will include conductors and insulators, charging by friction and induction. Demo: a charged capacitor will be used in a shocking demonstration. Answers to chapter 14 test practice. Homework: take notes on chapter 32.
discuss properties of charged materials. Procedure: start chapter 32, Electrostatics. Administer reading quiz on chapter 32. Sing about scientists. Hand out packet on Static Electricity. Demonstrate use of tape to detect charge. Have students work in groups on the packet, to examine properties of charged materials. Homework: selected review questions from chapters 12-14. Procedure: Review for a test on chapters 12-14 by going over review questions, review sheets for chapters 12-14. Homework: study for a test on chapters 12-14 on Friday. explain forces in the sun and how black holes may be formed. Procedure: Discuss gravitational fields, weight, weightlessness, tides, black holes. Demos: using a projector as the sun, demonstrate the positions of the Earth and moon during spring tides and neap tides, during solar and lunar eclipses. Discuss phenomena explained by concepts of circular motion. Procedure: administer reading quiz on chapter 9, discuss sections in the chapter to cover the above topics. Clips from 2001: A Space Odyssey will be shown to demonstrate methods of creating artificial gravity. Demos: spin water in a bucket, spin platform on which a jar of water is placed, show a marble in a petrie dish, play a few seconds of Revolution on a turntable. Procedure: Students will perform a lab on centripetal force using stoppers on strings weighted with washers. Procedure: discuss sections in the chapter to cover the above topics, finish worksheet started Thrusday, continue with second worksheet. Also, students will finish stopper lab if not completed on Thursday. Review for a test on chapter 8, energy. Test on chapter 8, energy. Review law of conservation of energy, perform a lab on energy. Procedure: Discuss simple machines, mechanical advantage, then students will get into lab groups and describe the operation of several different simple machines (hand tools), pulleys. Homework: do review questions for chapter 8 on energy. Procedure: conduct review of concepts covered in chapter 8 by finishing a problem set on energy, answering homework questions. Go over worksheets on energy. Procedure: Introduce the concepts of work and energy. Sing Machine Like You. Assign/describe crossbow project. Homework: take notes on chapter 8 for a reading quiz on Tuessday. Procedure: administer reading quiz on chapter 8, discuss sections in the chapter to cover the above topics. A worksheet will be used to check comprehension. Demos: steam engine, swinging mass suspended from the ceiling, happy and sad balls, vibration cart, tennis balls and Velcro® catcher. Procedure: students will perform a lab demonstrating the mechanical advantage of pulley systems. Objectives: students will be able to define momentum define impulse give at least two situations where momentum helps explain physical phenomena. Procedure:continue with chapter 7 on momentum, discuss momentum, impulse, show the rest of Running with Momentum, Relaxing with Impulse, solve problems. Procedure: continue with chapter 7 on momentum. discuss conservation of momentum, collisions, momentum vectors. Students will work on momentum worksheet and concept development page 7-1. Procedure: continue with chapter 7 on momentum, discuss conservation of momentum, momentum vectors. Students will work on momentum worksheets, guided practice. Demos: methanol rocket, spring loaded bar hitting different masses, shows rifle/bullet action/reaction, skateboarders playing catch, review worksheets. Homework: study for a test on Newton's Laws. Procedure:Administer reading quiz on chapter 7, begin chapter 7 on momentum, discuss momentum, impulse, bouncing. Demonstrations: egg in the sheet, breaking boards, walking on long skateboard, fan cart. Procedure: students will perform a lab on air resistance, write up the lab report in class. Homework: take notes on chapter 6 for a reading quiz on Wednesday. Procedures: Administer chapter 6 reading quiz. Discuss chapter 6 on action and reaction. Procedure: Discuss chapter 5, Newton’s second law and pressure, show examples, students will work on the Newton's Law Packet. Procedure: students will perform the lab Getting Pushy on Newton’s Second Law of Motion, write up the lab report in class. Car check. Bring in cars for inspection/assistance. Finish chapter 5 on Newton's 2nd Law, start chapter 6 on action and reaction. Homework: take notes on chapter 6 for a reading quiz on Monday. Demos: methanol rocket, spring loaded bar hitting different masses, shows rifle/bullet action/reaction, skateboarders playing catch. Do a lab on Newton's Second Law of motion. Procedures: Administer chapter 4 reading quiz. Start chapter 4 on inertia, cover Aristotle and Galileo. Students will complete the Concept-Development Practice Page on Newton’s First Law of Motion – Inertia. Introduce car project. Demos: plates and tablecloth demo to show inertia, 2x4 and dowel inertia demo, weight and string demo, steel marbles on incline, showing Galileo’s vision of motion. Define Newton’s second law, give examples. Procedure: finish chapter 4, start chapter 5 on Newton’s Second Law. Demo: physics teacher places cinderblock on abdomen while lying on a bed of nails, has a student smash the cinderblock with a sledge hammer. Procedure: discuss projectile motion. Demonstrations: spring-loaded steel ball launcher showing that a ball will fall vertically at the same speed as a ball launched horizontally, shoot the monkey apparatus. Procedure: conduct review of concepts covered in chapter 3 by answering homework questions. Go over worksheets on vectors. Students will finish concept development pages and packet if not completed. Homework: study for test on chapter 3 on vectors. Procedure: weather permitting, students will fly egg planes. Students will be given at least two tries to fly their plane, the grade will be based on best distance, integrity of egg after flight, and disposition of the plane after launch (throw it away!). Objectives: students will be able to graphically find the resultant of two vectors. Demonstrations: addition of velocity vectors with moving car on moving platform, also three students on a rope: two pull on the ends, one pushes down in the center, weight on springs. Demonstrations: spring-loaded steel ball launcher showing that a ball will fall vertically at the same speed as a ball launched horizontally. Shoot-the-monkey apparatus, if time allows. Procedures: begin discussion on vectors, components of vectors, components of weight, discuss graphical vector addition, work on page one of the vector practice pages. Procedure: weather permitting, students will perform a lab on vectors. Procedure: students will perform a lab on motion, write up the lab report in class. Procedure: students will work on velocity and acceleration problems. Study for a test on chapters 1 and 2. Objective: students will demonstrate knowledge of concepts covered in chapter 2. Procedure: administer test on chapter 2. Homework: read chapter 3, take notes for a reading quiz. Procedure Administer reading quiz on chapter 3. Weather permitting, students will perform a lab on projectile motion. Procedure: students will determine the period of a pendulum and determine an equation that describes the motion of the pendulum. Students will use their data to determine the period of a different pendulum on display in the classroom. Homework: take notes on chapter 2 for a reading quiz. 4. Rearrange equations to solve for each variable. Procedure: Administer reading quiz on chapter 2. Define velocity. Use lecture and demonstrations as needed. 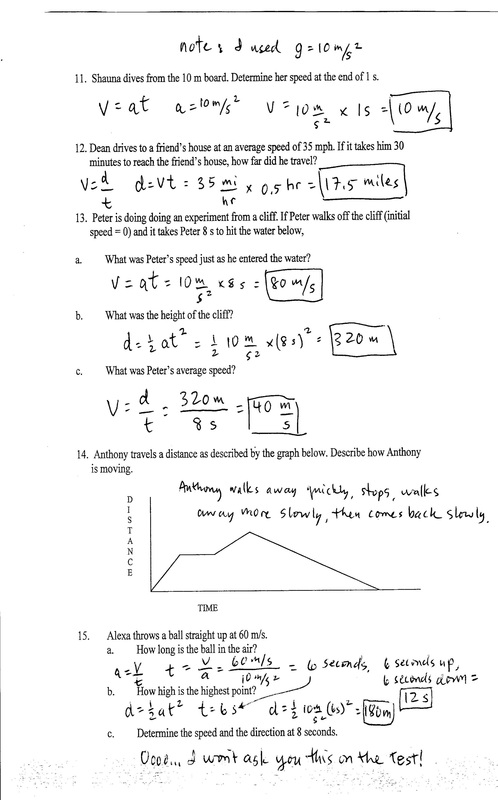 Distribute and work through velocity worksheet. Demos: use car and ball on track as examples of constant velocity and acceleration respectively, pendulum to show changing velocity. Objectives: students will be able to solve problems using concepts and equations of velocity and acceleration. Procedure: Check velocity comprehension with more exercises. 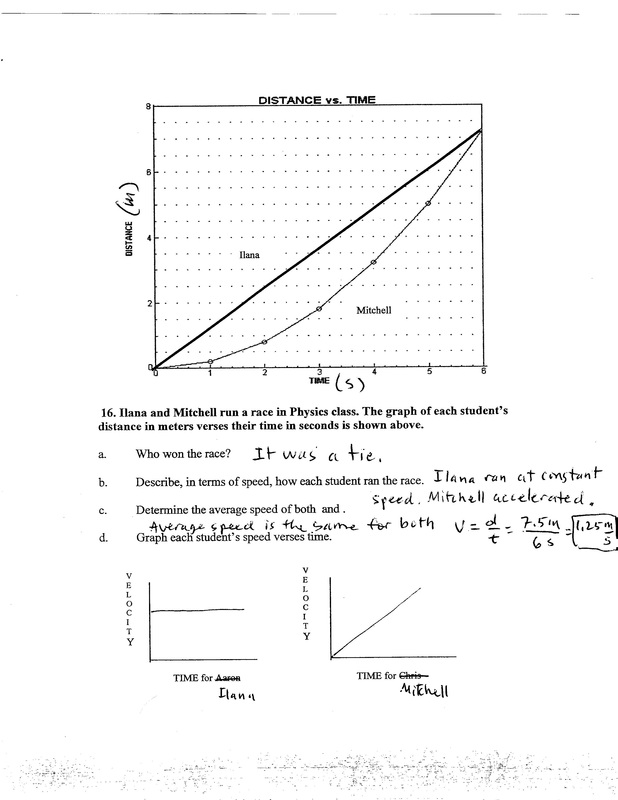 Continue with acceleration worksheet. Show demonstrations as appropriate. Procedure: finish acceleration worksheet, administer a short quiz to test comprehension. Students will do a lab activity, Graphing Lab, in which students study the motion of a ball on a track and a battery-operated buggy. Students will decide which parameters are important, describe a brief procedure, graph data and report results. Procedures: discuss topics covered in chapter one, introduce plane project. 1. Assign seats, take roll, give overview of the course, including goals and expectations, distribute Classroom Rules and Consequences, department conduct and safety rules.